Posted by liverpoolchamber in Offers. At just 9.1 X 6.7 inches and weighing less than 1kg, the Netbook can be taken anywhere. Purpose built to provide the complete experience – using either a Vodafone SIM or Wi-Fi – both built in for instant access. Stay in-touch with the office through email, gain access to company systems. The offer is for Everton’s away game against Blackburn Rovers on Weds 4th March, 8pm kick off, hospitality starts at 5:30pm. The option is on the Pennants Lounge, this is a 3 course carvery style lounge with a choice of either Executive Seating or Away End tickets, match programme and team sheet as well as car parking for every party of 4 or more. Full package details can be found here. For this game Blackburne usually charge £180 (+vat) per Person but for this game they can offer it to Liverpool Chamber members for half price £90 (+vat) if you book 4 or more places. People can call Gemma direct on 01254 296 116 or email her on gemmah@rover-mail.co.uk if you have any questions or wish to make a booking. Don’t just book a hotel room – book a Suite! Surprise your special someone with a Suite at Staybridge Suites Liverpool and really win their heart this Valentines Weekend. Okay, so the exercise option may not be the most romantic suggestion we’ve made, but feel free to use it to burn off the complimentary box of chocolates you’ll find in your suite. Enjoy all this for just £89 per suite per night, including a chilled bottle of wine and a box of Thorntons chocolates. And, for just £30 more, why not upgrade to a one-bedroom suite? Our rates exclude VAT but include our buffet breakfast and free wireless internet access. Limited parking is also available at the hotel for a small charge. Fancy a long leisurely lay in? For just £20, you can keep your suite until 4pm the following day. Perfect for breakfast in bed! These special offers are available for the nights of 13th and 14th February but subject to availability. To book ASAP and really earn some Brownie points, call Kerry or Nicola on 0151 703 9700 or email us at sales@liverpool.staybridge.com. Chamber members Blue Bar & Grill and the Pan Am Restaurant have a fantastic offer on throughout January 2009. They are offering a huge 50% off food bills in their restaurants this month. The offer applies for up to six people and can be used after 6pm in their restaurant any day except Saturday. And if you keep hold of the voucher, you can use it as many times as you want. Download the Blue Bar & Grill voucher here. Download the Pan Am Restaurant voucher here. Credit Management Group UK can provide help to Liverpool Chamber members and all at a reduced cost. Chamber members can now access the CMG Zone, the Online Credit Manager’s Toolkit. This Toolkit provides online assessment, short e-learning ‘movies’, factsheets and template letters and forms on a range of topics that cover the whole ‘order to cash’ process. These include credit risk assessments, collection strategies and how to take court action to recover debts. Other features include frequently asked questions, ask the expert and the provision of credit check reports on members’ business customers. Jenny Esau, Director of CMG UK says “Businesses often focus on sales and forget to make sure their customers have the ability to pay them until it’s too late. “Often we find, if a business had followed some simple steps and procedures at the beginning of the trading relationship, it vastly increases their chances of getting paid when the invoice falls due. Unfortunately we do get companies coming to us to help them get specific debts paid and we sometimes find we can not help them. If you would like to reduce your risk to bad debt, protect your profit and make sure your business survives these trying times, take a look at the CMG Zone, the Online Credit Manager’s Toolkit here. You can sign up for a free 7 day trial to see how CMG UK can help you get your invoices paid in full and on time. Posted by liverpoolchamber in Events, Liverpool, Media, News, Offers, World Wide Web. Every week, Liverpool Chamber sends an e-newsletter to nearly 6,000 recipients. It covers our news, top tips and what’s happening in the wider business community. As part of this, we offer both members and non-members the opportunity to sponsor the newsletter. It’s a great way to get your message accross to your target audience. We ask that adverts are supplied as a jpeg file, 220w x 125h pixels in size. 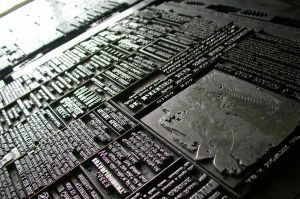 Alternatively, we can create an ad for you at an additional cost of £10. We would also require any other copy / images for inclusion on our blog, or the URL of your desired target page. We also send out a bi-weekly events newsletter, which can also be sponsored, at the same rates, if you have an event to publicise. If you are interested in sponsoring our newsletter, please email Nick Jones to find out more. 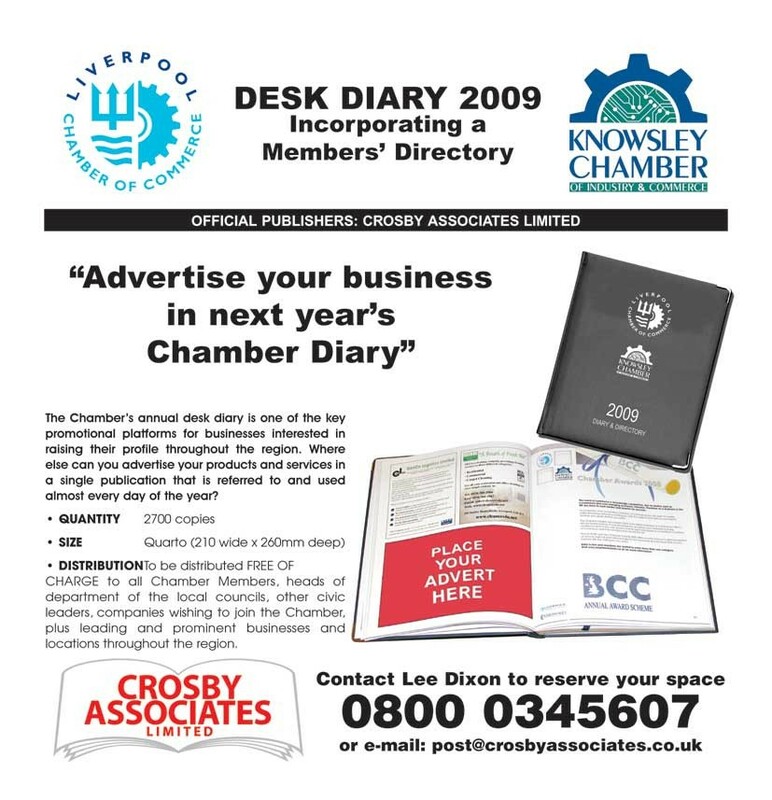 If you want the chance to promote your business to our entire membership at a great rate, why not place an advert in our 2009 desk diary and members’ directory? The Chamber’s annual desk diary is one of the key promotional platforms for businesses interested in raising their profile across the region. The diary is distributed free of charge to all Chamber members, heads of departments in local councils, civic leaders plus leading and prominent businesses across Merseyside. Where else can you be seen in a publication that is used almost every day of the year? Posted by liverpoolchamber in Business, Chamber Services, News, Offers, Training. Why indeed! When you have a free service right on your door step. As members of the Liverpool Chamber of Commerce you are entitled and indeed encouraged, to make use of the Trident Training Recruitment Service which is FREE to members. The Learning & Skills Council provide funding of 100% for any staff in the 16 to 24 years old age group to gain a National Vocational Qualification through the apprenticeship scheme which is also open to existing staff in this age group. The employer is responsible for employing the employee at an Apprenticeship wage of not less than £80.00 per week. Also the employer is responsible for ensuring that the employee receives support and assistance with their apprenticeship program.